Dorothy Boenker, a resident of Bethesda Terrace in South St. Louis County for five years, is used to seeing the friendly and smiling faces in her tightly-knit community. At the end of August 2016, however, she began to see a new face. One that, for some reason, stood out from the crowd and caught her attention. Dorothy found herself staring at her new neighbor. She had an odd feeling she couldn’t shake that she was already acquainted with the woman. After several days of trying, unsuccessfully, to piece together the mystery, Dorothy decided to approach her new neighbor to see if she could verify her intuition. When the new neighbor replied that, like Dorothy, she attended Benton Grade School and Beaumont High School in north St. Louis County, suddenly everything began to make sense. The mystery woman revealed her name is Betty Valentine — formerly Betty Link. That’s when Dorothy realized the pair originally met in kindergarten, three-quarters of a century earlier in 1941. The lifelong friends reunited as they looked at their senior year photo from high school and reflected on their good fortunes. In the shot, Dorothy is standing just behind Betty on the steps of Beaumont High School. 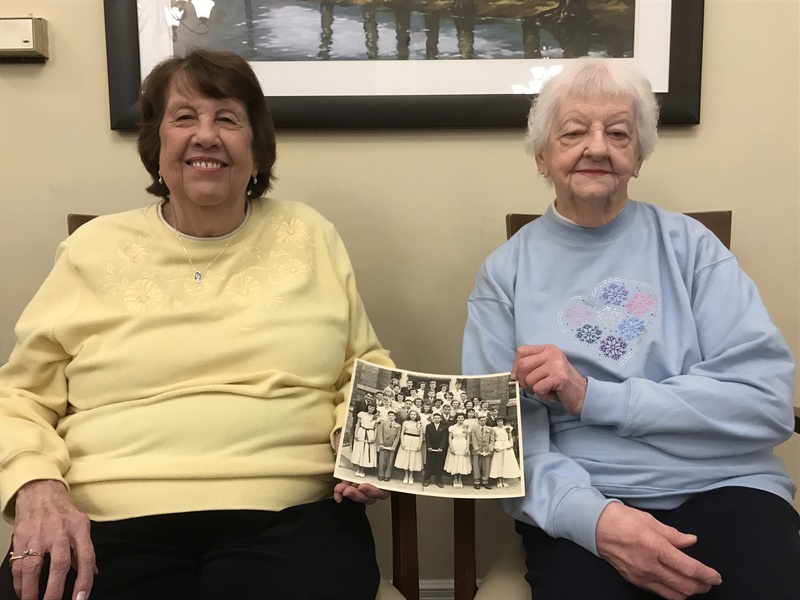 Both women kept a copy of the photo for more than seven decades, but Betty decided to toss hers out when she packed her belongings to move into Bethesda Terrace. She instantly regretted her decision upon reuniting with Dorothy, and was thrilled when Dorothy happily made a new copy of the picture for her newly-rediscovered friend. Dorothy and Betty became separated shortly after graduation in June of 1953, when they both got married. Dorothy stayed in north St. Louis County, while Betty moved with her new husband, a police officer, to south St. Louis. Busy with their new and changing lives, they lost touch. Dorothy, a member of the Bethesda Terrace welcoming committee, said she’s planning to invite Betty to participate in the many clubs and activities available at their new shared residence. Moving to a new place can be scary, but Bethesda offers a sense of community to feel like home right away. While Betty has fit in well since moving to Bethesda Terrace, she said it’s comforting to have an old friend to make her feel at home. That leaves plenty of time for the long-lost friends to get reacquainted. Dorothy said Betty has only begun to see all the things Bethesda Terrace has to offer – the beautiful grounds, pleasant atmosphere and long list of available activities and amenities. She plans to help show her childhood friend around. We at Bethesda take pride in our sense of community, and we often feel like one big family! Schedule a visit to Bethesda Terrace to find out why there’s no place like home.